Well it is exactly one year since Smt. Rajeshwari Padmanabhan, the veena maestro and my Guru, passed away. It had been a day filled with listening to her veena pieces. While the day went by, I felt a celebration of music. Yes, I would like to remember her as a great maestro, a warm motherly figure and someone whose talent was not commercialized. She was a musician of par excellence. Nostalgic memories of her classes rushed back to my thoughts. While playing one of the pieces – Vinayaka in Hamsadvani, a surge of emotions overwhelmed me and I found myself crying for a while. Then composing myself, I decided that her life should be celebrated in her remembrance. I found this short video of her taking classes by Raghunath Manet on youtube. 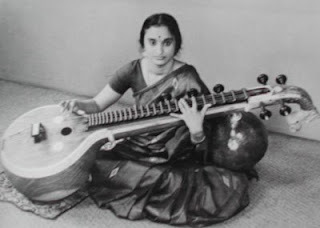 Rajeswari Padmanabhan, daughter of Lakshmi Ammal and grand daughter of Karaikudi Subbarama Iyer (the elder of the Karaikudi Veena brothers), was a ninth generation descendent from the Karaikudi Veena tradition. From the very young age of five, she was under the tutelage of her grandfather Karaikudi Sambasiva Iyer (the younger of the Karaikudi Veena brothers) in the Gurukula system and remained under his guidance until the demise of the maestro in 1958. Later, under the Government of India scholarship, she continued her training in vocal from the composer Late Sri. Mysore Vasudevachar. She was principal of Kalakshetra where she worked and taught for many years. Among the numerous awards she has received, she was also the recipient of the Kalaimamani and Sangita Kalanidhi. Smt.Rajeshwari was known for her musical integrity and virtuosity. Besides performing, she has composed a few varnams and tillanas, has set to tune the text of Kumbeshvarar Kuravanji for a dance drama, and is also credited with innovative approaches towards making the portable Veena and designing a new acrylic ‘melam’. In the new acrylic ‘melam’, the conventional honeybee wax on which the Veena frets rest is replaced with acrylic. The acrylic design offers durability without sacrificing the tonal quality of the Veena. Smt. Rajeshwari padmanabhan passed away on the 15th of August 2008.